Why Are Bottles Bad For Your Child’s Teeth? 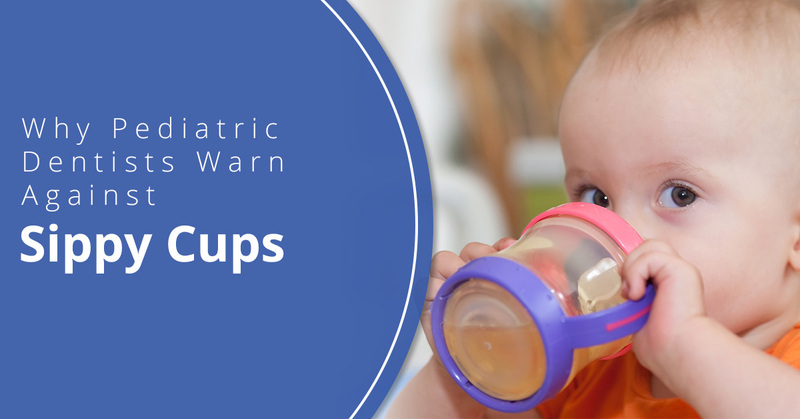 Sippy cups are commonly used among children who have recently graduated from using bottles. Your child typically should move from breast to bottle at around 12 to 24 months. However, once they are older than about a year, as a parent, you should be weaning your child off the bottle. Why? Multiple pediatric dentists have warned about the terrible effects bottles have on your child’s teeth. In this blog, we are going to discuss the effects of bottle-feeding to your child’s teeth and how you can train your child to not want the bottle as much. Once your child is past a year old, it is important to start thinking about their teeth. Bottles can reposition their incoming teeth, causing misalignments. Not only that, but bottles don’t provide very much protection for your child’s teeth against bacteria. It is common for young children to be at risk of baby bottle tooth decay, especially when they are avid bottle drinkers. What Is So Bad about Bottles? Bottles, themselves, aren’t bad for your children, however, overusing the bottle can be a problem. Unlike sippy cups and regular cups, bottles allow sugars to stay on your child’s teeth or gums. For instance, when your child drinks milk or juice, both solutions are filled with sugar. With sippy cups and regular cups, the beverages are swallowed past the teeth, so bacteria doesn’t stick to the surface of their teeth. With bottles, children slowly sip on their beverages, allowing what they are drinking to make direct contact to their teeth. What is Baby Bottle Tooth Decay? When your child uses a bottle for too long, they run the risk of developing a type of tooth decay common among young children. As stated, bottles can be hard on your child’s incoming teeth because they allow sugar from their milk or juice to get trapped on their teeth. When sugars are allowed to stay on their gums or teeth for too long, the natural bacteria from their mouth attacks the sugars. Because of this, acid forms and starts to eat away at your child’s teeth. More importantly, their enamel is primarily targeted, which is your child’s protective layer for their teeth. Without the enamel, your child’s teeth won’t be able to defend against other forms of dental decay for their entire lives. It is important to monitor how often and how long your child uses their bottle. It is important to take steps to ensure they are weaned off the bottle and begin using a sippy cup. Though your child doesn’t need to use a regular cup right after their bottle, it is important to encourage regular cups drinking. Not only that, but you need to encourage and motivate your child to regularly brush their teeth. As toddlers, teeth brushing can be a challenge, however, by teaching them to brush their teeth, you can ensure that any sugar that does stick to their teeth is cleared away. If you are curious about your child’s dental needs and are looking for experts in the pediatric dentistry field, Chess and Taub Dentistry has specialists on staff. With our expertise, you can learn what you need to do to ensure that your child doesn’t develop teeth decay or any other serious dental issues. For more information, contact us today.